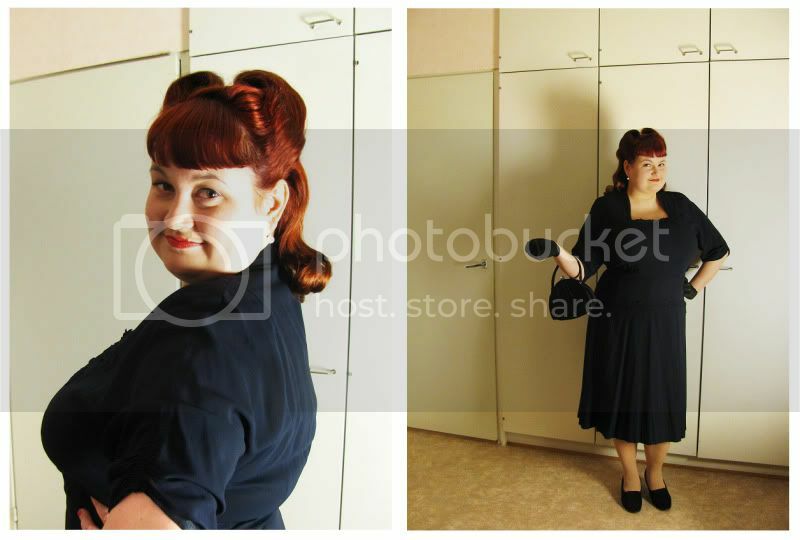 I was very nervous about wearing one of my favorite dresses to the event, considering that it is vintage and drunken Finns are not the most considerate of people... Thankfully the dress is still in one piece, although looking back on it I really should have been smarter and not have taken the risk. Oh well, you live and you learn! Attending the show made me wonder what the burlesque scene is like in London. It has been really wonderful to attend burlesque shows monthly during my stay in Finland. I hope the scene is as active and fun in England. It has been a treat to be able to dress up and attend these type of events on a regular basis and I hope to continue doing so in the future. Love your hair and that dress! that's a really chic dress! The mermaid burlesque act sounds fantastic! Your hair looks gorgeous! Love the dress, too! you look lovely, and don't worry there is plenty of burlesque going on in London, almost too much, you have to be a bit picky about what you see! Little Miss B - Thank you! Can't wait to see what the London burlesque & vintage scenes are like! I so would have loved to seen the Little Mermaid act! And while I know you were worried about the dress, glad nothing happened. Besides whats the point in buying such lovely dresses if you can't wear and showcase them and dress up at events like this! Mycah - Wish you could've been there!